Out-of-date drivers can keep devices form working properly. Manually updating drivers is a dull, tedious task easily forgotten. PCWorld recently reviewed several automatic driver update utilities that pledge to make the task less onerous. Some of these programs (particularly the free and demo versions) identify driver updates for you. The full-featured, more expensive ones will update them as well. We show you which programs are worth the download, and which you should give a miss. Like its rival Perfect Updater, ReviverSoft's Driver Reviver begins to scan your PC for out-of-date drivers as soon as you launch the app. I prefer the approach taken by another rival, DeviceDoctor.com's Device Doctor, which waits to begin scanning until you've manually started the process. But you can pause the scan, and in all other areas, both PerfectUpdater and Driver Reviver drastically outperform Device Doctor. Read the full review and download Driver Reviver ($30, free demo). Device Doctor's bland interface tells you little of what you need to know about your drivers. DeviceDoctor.com touts the Device Doctor utility as a free and simple solution to PCs plagued with out-of-date drivers. This application delivers on its promise of simplicity as you begin to use it, but it doesn't deliver everything you need in order to get your PC's devices current. Device Doctor begins on the right foot: After you launch the app, it tells you to connect all your hardware devices and then asks you to begin the scan manually. Unfortunately, things go downhill from there, and quickly: whereas PerfectUpdater and both correctly identified more than 20 out-of-date drivers on my Windows 7 PC, Device Doctor found only seven. 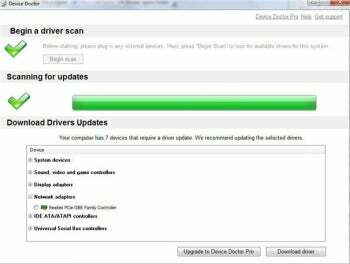 While Device Doctor does actually allow you to update drivers in its free version, the process is clunky. Instead of handling it within the app itself, you're bumped to Device Doctor's Web site, where you see an ad touting the $30 Device Doctor Pro, which promises automatic driver updates. Read the full review and download Device Doctor (free). Raxco Software's PerfectUpdater isn't perfect, but this application is one of the best solutions I've found for locating and fix out-of-date drivers on a Windows PC. Once PerfectUpdater has located your out-of-date drivers, it presents them to you in a neatly organized list that makes it easy to see just how old they are. It correctly identified 21 out-of-date drivers. If you're using the free trial of PerfectUpdater, your experience ends here. But if you are using the paid version, you can move on to the updating process: You can select which drivers you'd like to update, and once it begins, the process is seamless. And it even creates a system restore point for you automatically--a useful thing that's all too easy to neglect to do manually. Read the full review and download PerfectUpdater ($30, free demo). Uniblue's DriverScanner 2012 works very much like rivals Perfect Updater and Driver Reviver. It scans your Windows PC for out-of-date drivers as soon as you launch the app, and quickly reports back to you on the status of your system. DriverScanner 2012 has an attractive visual interface. The offending items are listed with an icon that immediately makes it apparent whether your drivers are "old," "very old," or "ancient." DriverScanner uses large icons to identify the drivers, too, making it easier to tell when the application is talking about a sound controller instead of a USB controller, for example. 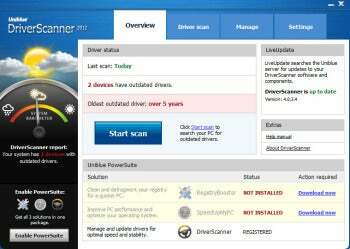 Read the full review and download DriverScanner ($30, free demo).